About Venice: Stretched across a group of 118 small islands in Northeast Italy riddled with canals and linked by bridges. The city and marshy lagoon where it is located are UNESCO World Heritage Sites. Here composer Antonio Vivaldi and explore Marco Polo were born, and Casanova wrote about his romantic escapades. Golden streaks of sunlight filter through my glass of Prosecco directing the eye to the shimmering canal below. Jesus and I are outside a small hole-in-the-wall bar in Venice, leaning against the cement and brick wall that separates the walkway from the waterway. I take a sip of my sparkling wine and watch a couple of local teenagers cruise by in a motorboat. “When do you think kids here are allowed to drive boats?” I ask Jesus in Spanish. Since he is busy snapping pictures of his glass of wine with the canal in the background, he shrugs and does his I-don’t-know frown. Since we paid before taking our drinks out into the sunshine, I gulp down the last drops of my drink, Jesus grabs our glasses, plunks them down on the counter inside, and we’re off. Wandering endlessly should be declared the local sport in Venice, where a straight route from A to B is nearly impossible. 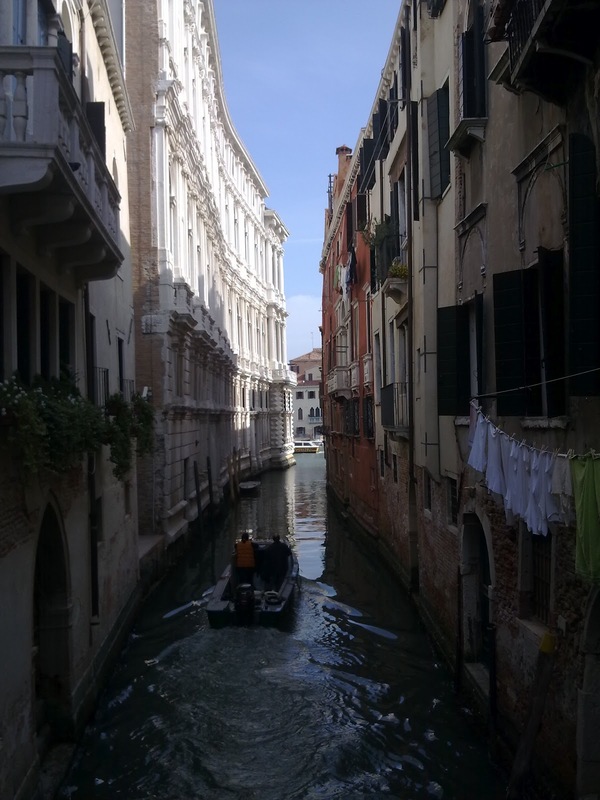 To find any given place in the floating city we traverse a labyrinth of streets that dead-end in water, and bridges that lead to abandoned palazzos. Almost eight years have passed since the last time I set foot in Venice, but since I’ve been before, and Jesus hasn’t, he expects me to act as the expert. Which is hilarious considering my sense of direction can get me lost in Barcelona, the city I’ve lived in for over seven years now, not to mention my hometown in Missouri. Not that it matters. Getting lost in Venice is a large part of its charm. Cheesy storefronts crammed with “I heart Venice” key-chains, souvenir mugs and glass figurines made in China share the streets with shops hawking traditional Venetian wares. There are hand-made journals, brightly colored Murano glass and intricate Burano lace fans from nearby islands. Carnevale masks in a multitude of shapes face the world with shameless decadence, elaborately adorned with metallic paints, fabrics and feathers. One window houses massive cheeses and funny sausages shaped like pigs. 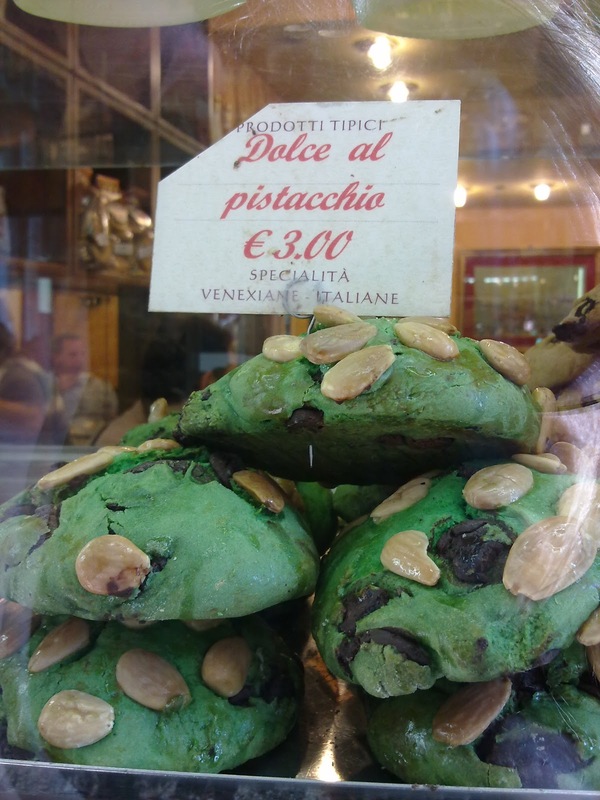 Behind another sheet of glass are piles of sweets, among them fist-sized acid-green cookies with nuts and chocolate chunks, labeled Dolce al Pistacchio (pistachio sweet). I’m immediately intrigued (brightly colored edible things), but Jesus yanks gently on my arm, reminding me that we are actually looking for something—a supermarket. Since we’ve been walking in circles for almost an hour now, I flag down a woman smoking outside a hip boutique and get directions. At the tiny grocery store, we shake bottles to make sure we’re buying still water. I grab some bread, salami, prosciutto and smoked provolone for sandwiches. Jesus adds a bag of olive oil-flavored chips, and a few cans of beer. I top it all off with a bottle of Prosecco. After we drag our tired feet and shopping bags up five flights of stairs to our hotel room (3 stars, no elevator? ), we have a picnic feast on a narrow stretch of carpet in front of the television. There are no channels in Spanish, and we’re not up for CNN, so it’s MTV’s Jersey Shore, with subtitles in Italian, that blares in the background. I roll my eyes at the screen and turn to Jesus. “Tomorrow’s another day. 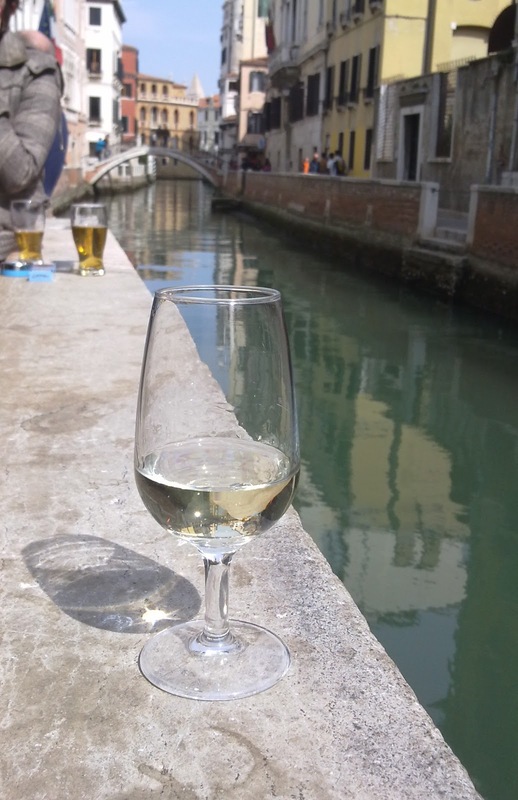 You, me, and Venice,” I beam, holding up the bottle of Prosecco. Getting There: Venice can be reached via train, bus, plane (Venice Marco Polo and Venice Treviso Airports), ferry or car from other points in Spain and Europe. Direct flights from outside of Europe are only currently available to Venice Marco Polo. If you’re already in Europe, budget airlines (Ryanair, EasyJet, Vueling) will get you to Venice Treviso on the cheap. I flew Barcelona Prat to Venice Treviso for less than 90 euros round trip. Where to Stay: I don’t recommend where I stayed in Venice on either of my visits. I would instead direct travelers to stay in a GoWithOh rental apartment. Apartments are centrally located, and affordable if you’re traveling in a group of two or more, plus having a kitchen means you can shop in Rialto Market and cook! What to See: When in Venice, I prefer to wander, occasionally dead-ending in a canal, and highly recommend eating and drinking in osterie off the beaten path, as well as a canal ride, sunrise or sunset in Piazza San Marcos and a morning spent shopping for edible goodies in Rialto Market. 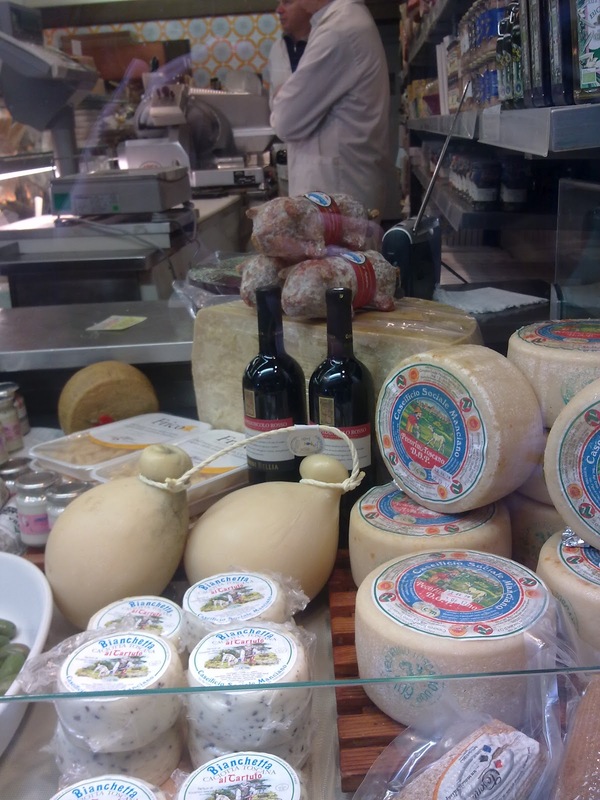 Where to Eat: Do Mori at San Polo 429, Calle dei Do Mori one of the oldest bars in Venice for traditional Venetian Fare and Caffe Rosso at Campo Santa Margherita for drinks–go for the spritz (Prosecco with Campari and mineral water)–it’s a Venetian thing. 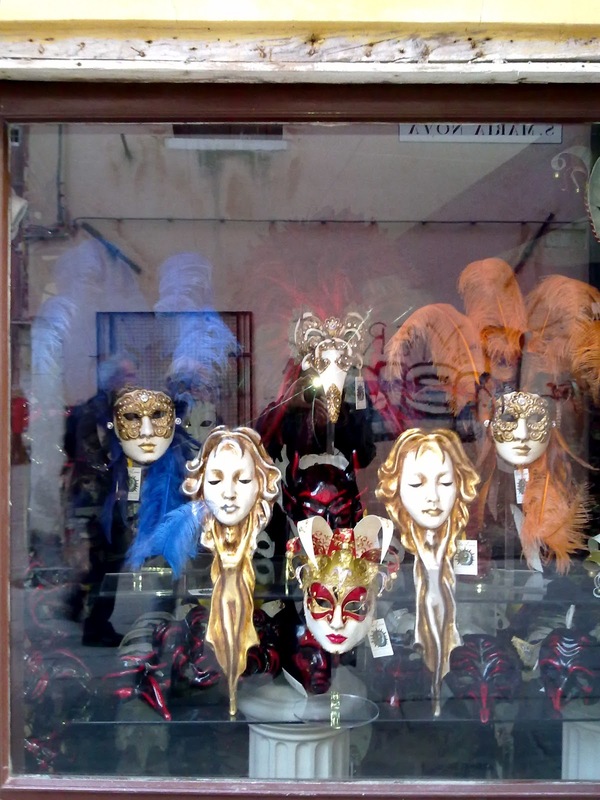 Where to Shop/What to Buy: Rialto Market for food, Trois for Fortuny fabrics, and Mondo Novo for masks. When or if you buy glass, make sure it doesn’t say P.R.C. (People’s Republic of China) on the bottom. Have you been to Venice? What did you like best about Italy’s most famous canal city?